The image on the left may well lack detail yet conveys a lot of informations. This is the power of silhouette, a graphic technique popular in seventeenth century. With the current trend being faster action sequences and split second cuts, making the most of this brief screen time is more important than ever. Staging your scenes so that the most important actions are shown in silhouette makes them more readable and powerful. If you can tell what's happening from a two color image, your shot is strong. Have a look at these four images. The silhouette is a good estimate of how easy it is to perceive the action in the full color frame. And, yes, the shooting in silhouette pun is intended. You need more time to completely read the couple of images on the left than those on the right because you have to interpret the image's contents. Now think about these images inside an action sequence, where the actress holding the gun is just as small as in these images — she's standing in the background. Which one is more likely to provide a well rounded experience for the viewers? Think of silhouette as some sort of headline, if it's bold and informative you can even skip the article and concentrate on something else. In Murnau's Nosferatu the prowling vampire's most remembered shot is a shadow silhouette which has been copied countless times over the years. You can easily recognize an homage to Murnau in Harry Potter 7 / Part 1. The Deathly Hallows legend is narrated in silhouette, and Death looks similar to Nosferatu. In the Austin Powers movies there are some excellent stagings where objects held by the actors create sexual innuendo silhouettes. In Star Wars Episode II, Anakin's dark side is subtly depicted with a digitally retouched shadow that resembles Darth Vader's helmet. An out of focus background is an excellent device to isolate the main character from distracting details. This is a silhouette technique as well, and today cinematographers working with DSLRs keep exaggerating the shallow depth of field because it makes storytelling so much easier. It's just like having a spotlight pointed straight upon the performer on stage: the audience can not get distracted. An apache helicopter hovering in distance needs no sophisticated camera matching, skillful modeling or realistic global illumination. Coupled with an appropriate sound effect, a shot like this can improve production value at little to no cost. It can be produced entirely within a compositing application animating an high contrast photograph or even and hand drawn sketch. This cost saving can be extended to props you don't have on set. You can even get away with a cardboard gun or sword as long as you shoot it without changing perspective. Want to try some silhouette shooting? 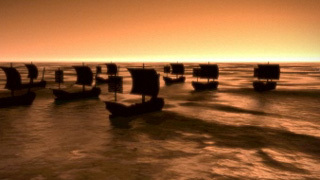 The opening image, with a bunch of junks sailing at sunset, is a 3D scene so simple that it's embarrassing. Literally takes less than a minute to setup. Add some stock music with an ethnic feel, slow chinese music, and cut the junks along with some stock footage of chinese drawings and vases. It's going to be a fun project, and can provide a no-cost opening sequence for a documentary or even an entire book trailer. Silohuettes are always around us. Try to recognize them as you look around. This will make staging in silohuette much easier.